This dungeon is not required to advance in the story line, in fact it isn't even available until after you complete the story! 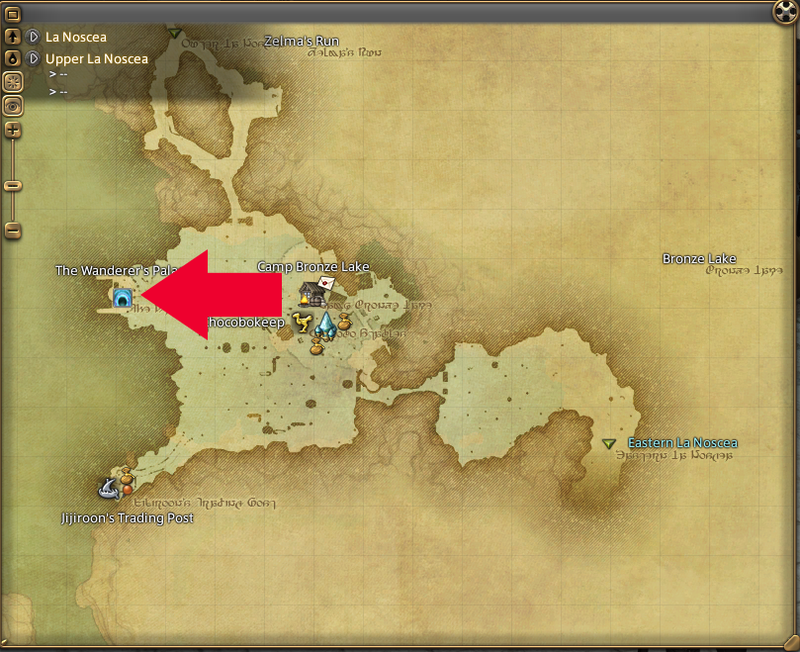 There is a NPC (Allene) oustside of the Waking Sands in Vesper Bay in Western Thanalan (11,14) that will give you the quest "Trauma Queen" to unlock this dungeon. If you don't even see that quest, you may need to get promoted more in your Grand Company. The Wanderer's Palace is a popular level 50 dungeon that players run to grind tomestones for gear, because of this - if you are new... you may want to be prepared for a speed run and impatient players. If you are a tank or healer it would be wise to mention that this is your first time at the beginning, just so the others are aware and can share helpful tips. If you can't group up with some friends or members in your FC, cross your fingers that you get some well geared party members from the Duty Finder. You will have a Light Party of 4 people, so there will be 1 tanks, 1 healers, and 2 dps. The waiting time can be a while, but not nearly as long as the previous instances, since a lot of level 50 players run this dungeon to get Tomestones. 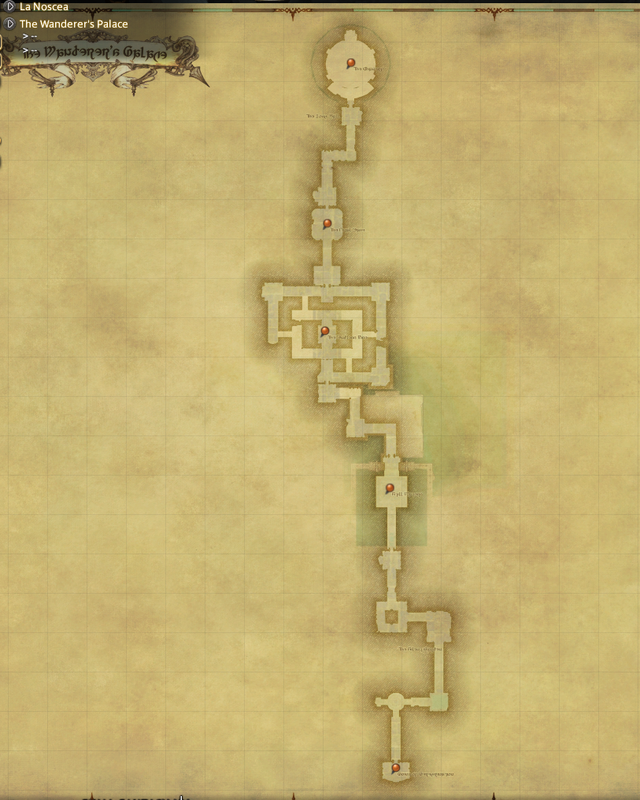 This is probably easier to run compared to Amdapor Keep, however, it still can be a little challenging. This dungeon also contains coffers that may drop materials needed to craft your Relic Quest line weapon. Keep in mind that after the 1st boss you will need to deactivate 'Nymian Devices' to open the lock doors - they will be marked on your map. At the beginning of the dungeon you will be followed by a Tonberry Stalker, so be on the look out form him! The tank should quickly pull trash to stay ahead of the Stalker, or at least pull trash to the corner of the rooms to stay out of the Stalker's way. IF the Stalker gets a hold of anyone, it will deal a large amount of damage, but not necessarily KO anyone. After the 2nd boss, Giant Bavarois, pull the group of Tonberrys near the final coffer down the steps to avoid triggering a Tonberry Stalker. There are also a few sections where a group of beetles will spawn. These are just past the first coffer, the 2nd coffer, and near the far west coffer just before the 2nd boss. These beetles can easily be AoE'ed down.